Goddess (Devi) Durga - Ma Durga (Mother Durga) riding her lion. Raga Durga is a 5 note raga (audav) – a pentatonic late evening raga. In the ascending and descending scale only five of the seven (7) main notes can be used: Sa Re Ma Pa Dha. The 3rd pitch Ga and 7th pitch Ni are not played which corresponds to the E and B in Western notation. All notes of Raga Durga are natural (suddha), thus neither diminished nor augmented. The modal form of Raga Durga is existing singular in North Indian Classics (Hindustani music). Raga Durga belongs in the classification system of Hindustani to Bilawal Thaat. Raga Bilawal, one of the 10 main ragas is in its nature seen as “male”. All derived ragas same Durga belongs to are considered as female, as Ragini-s. The origin of Raga Durga is not clear. Probably it was created in the late 18th /early 19th century. There exist the opinion that Raga Durga is derived from the South Indian Ragam „Suddha Saveri“ (Carnatic music). We find the same material of notes however with other 1st pitch also in Raga Malkauns or Bhupali. The 5 tone scales exist worldwide in many music systems, e.g. Greek pentatonic. As origin for Raga Durga only the region of South Asia can be assumed securely. Ma Durga – Mother Durga is one of the highest female divinities of India. In honours of Durga in different Indian Federal States and close neighbourhoods such as Bangladesh and Nepal the Durga Puja is celebrated of several days (up to 10 days). „The Durga Puja“ is the most important religious celebration in Hinduismus. To Become One With You (Refrain). Of Your Gentle Voice (Refrain). Reflects From Your Eyes (Refrain). Deep Within My Heart (Refrain). Protect And You Guide Me (Refrain). The annual date is fixed after the Hindu sun and moon calendar Chaitra. 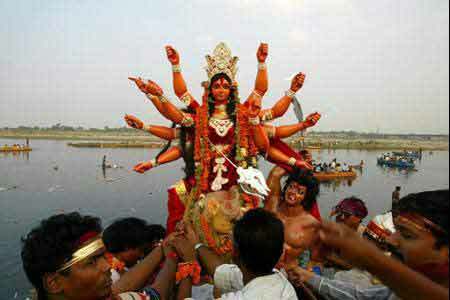 Durga Puja is celebrated in the 7th month Ashwin, in the first 9 days. The moon movement (Tithi) plays a crucial role. The month of the moon consists of two halves, the first full moon phase and second new moon phase. Mahalaya, the first day of Durga Puja falls on the new moon day and celebrates the return of the married daughter Durga to her father Himalaya. 10 Days with the Mother Goddess! Nava – that also means ‘new’ – denotes ‘nine’ the number to which sages attach special significance. Hence, we have Nava-ratri (9 nights), Nava-patrika (9 leaves / herbs / plants), Nava-graha (9 planets), and Nava-Durga (9 appelletions). 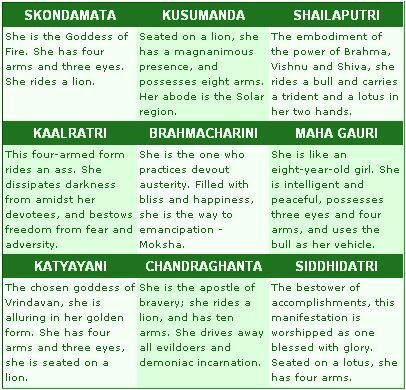 Here’re the 9 manifestations of Goddess Durga. Each goddess has a different form and a special significance. Nava Durga, if worshipped with religious fervor, it is believed, lift the divine spirit in us and fill us with renewed happiness. A selection of contemporary the Mother Goddess Durga paintings by courtesy of Exotic India Art Gallery, New Delhi. For bigger images please visit the About.com website. This entry was posted on September 21, 2010 at 8:54 pm	and is filed under ENG (English), IMC OnAir - News. You can follow any responses to this entry through the RSS 2.0 feed. You can leave a response, or trackback from your own site.